Rainbow trout are probably the most common and easiest to catch of all trout. They are stocked in many lakes and rivers and eat a wide variety of both baits and lures. They are also very popular among fly fishermen. Even the stocked fish, however, can often be picky and sometimes you have to try a variety of approaches before you find what they want that day. 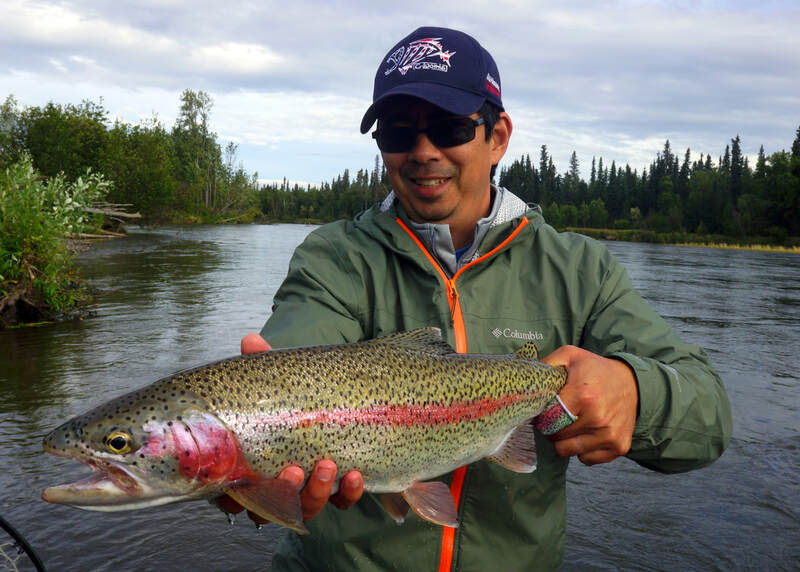 Most rainbow trout caught range from 1/2 to 3lbs in size, with anything much over that being a pretty decent fish in most places other than Alaska and a couple of other places. They, along with Largemouth Bass and Panfish, are the most commonly pursued freshwater gamefish in North America. Rainbows often jump when hooked and are a fun adversary on light tackle. As an added bonus, many of the mountain rivers and lakes where they are found are very scenic which adds to the fishing experience. 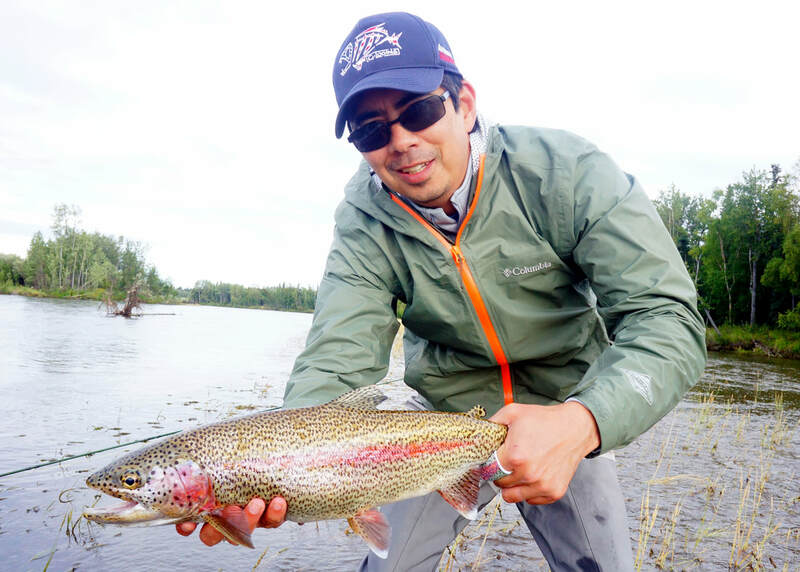 Wild-caught rainbows taste delicious. Even stocked Rainbows taste ok but obviously not as good as the wild ones since they were raised on pellets. If you are planning to catch and release, please see the release tips here. 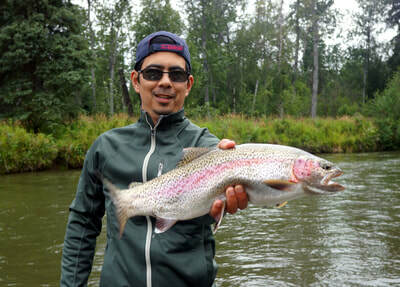 When fishing for rainbow trout I like to fish with the lightest line I can possibly get away with. Trout have good eyesight and will often be scared away by line that is too visible, especially in heavily pressured waters. 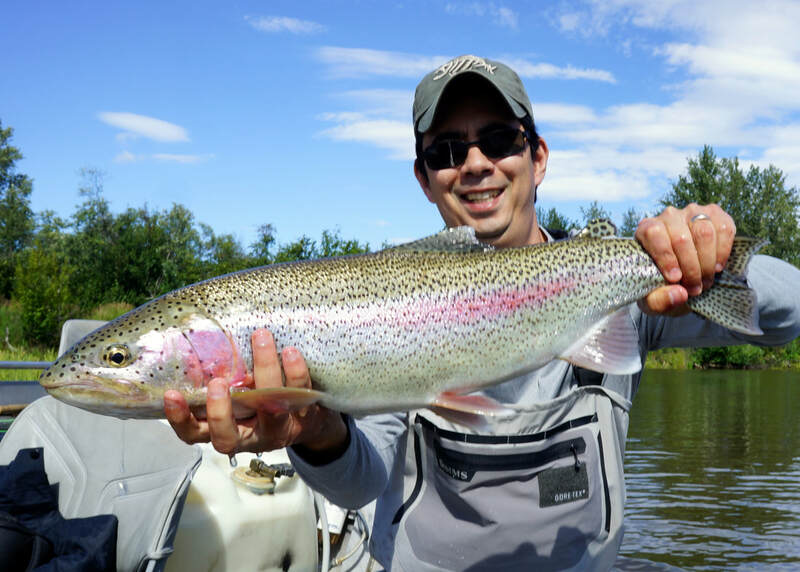 An ultra light rod and reel are usually sufficient to land most trout in still waters. You want a rod with a soft tip because Rainbows shake their heads a lot and you want a soft tip to absorb those shakes without pulling the hook. 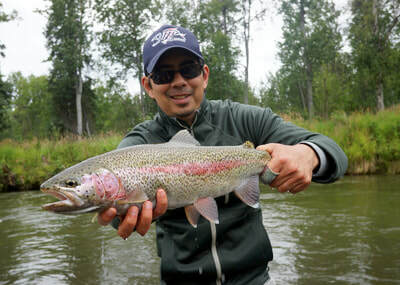 I generally fish with 2lb test line in nearly all situations when fishing for rainbows in heavily pressured areas, especially in still waters where they have a lot of time to inspect your offering. 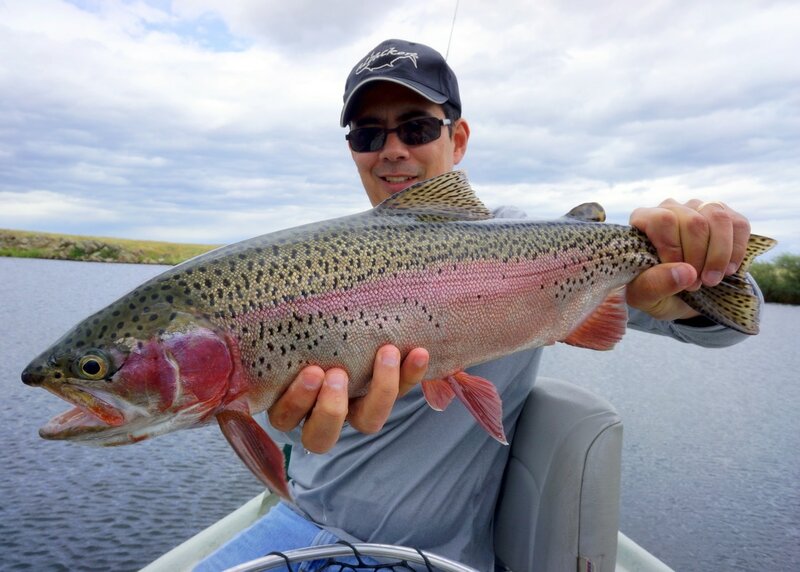 The largest fish I have landed on 2lb test was 6.5lbs and if you are patient you should be able to land much larger fish than that if you are fishing in lakes with no obstructions. 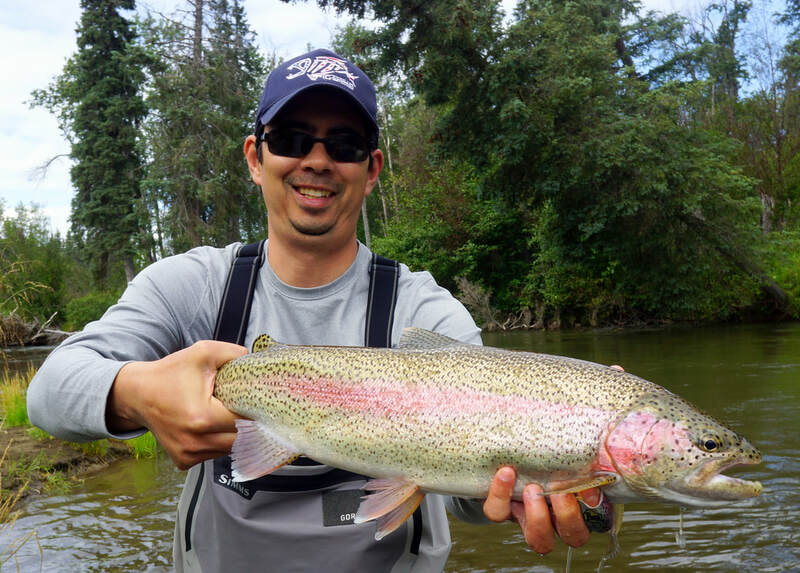 In murky water or moving water you can get away with heavier line, but in general it usually pays to fish with the lightest line that you can. In heavily pressured areas, you will generally see a big increase in the number of bites when using light line. There are a ton of ways to catch trout. Below are some of the ones that have worked well for me. 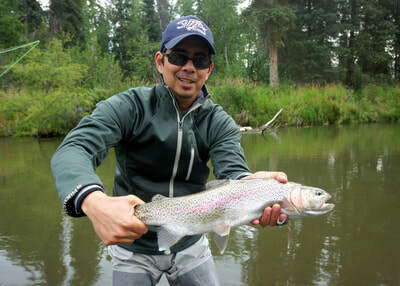 Rainbow trout eat a wide variety of lures, including spinners, spoons, plugs, and jigs in the 1"-3" size range. I like to pack a wide variety as trout can often turn on to one lure and turn off to another that they were biting the day or even the hour before. 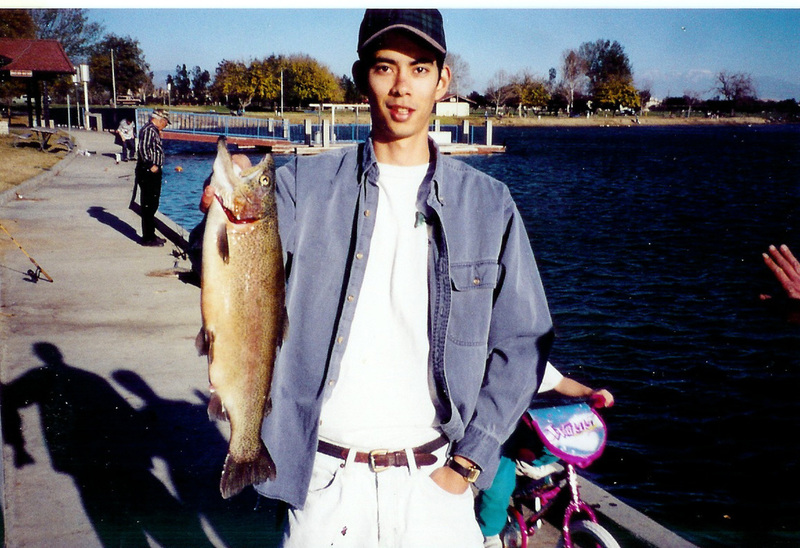 I once caught 13 in a row in about an hour fishing with a small green and yellow plastic jig. I then ran out of green and yellow jigs and switched to an identical jig in brown and yellow that looked almost the same and couldn't buy a bite. I switched back to the one torn up green and yellow jig I had left and immediately caught a few more. Like with any kind of fishing, it pays to observe people who are catching fish and see what they are using. If I had to pack just one lure for trout it would be a small silver and blue Kastmaster spoon. It also catches most other types of game fish that live in the same lakes and streams which is a plus. I also like silver with red. It casts great and has a nice erratic action. You can cover a tremendous amount of water with these due to how far you can cast them. My second choice would be a Panther Martin spinner in Rainbow Trout color. For both the spinner and the spoon I usually just use a steady retrieve. As soon as I feel a strike I set the hook. Lots of different spinners and spoons work well in different conditions; see the ones linked below. If I'm in a spot where I can see the trout or they are otherwise concentrated for some reason in relatively clear water, my choice would be a green and yellow rubber jig such as a Lip Ripperz (see link below) or Sierra Slammers. Those will usually entice a strike from fish you can see when the other lures won't get a look. Cast the jig to where the trout are, let it sink, twitch it occasionally, and let it sink again. Work it back in that manner and then repeat. Experiment with the speed of retrieve based on how the trout react. Almost all bites will come on the fall, and it takes some practice to detect those bites. A highly visible jig like the one pictured below can help detect a strike because you can see it disappear when a trout grabs it. If you want the trout to hold onto the jig a little longer you can try tipping it with a mealworm and/or adding fish attractant. I don't usually use scents on metal lures, but plastic lures hold scents well. Scents are especially important when the water is murky. Sometimes trout are focused on insects. You will see them rising to eat them on the surface and they usually ignore all other types of food during this time. If you are a fly fisherman then this is the time you have been waiting for, but if you aren't that into fly fishing then this can be frustrating. One approach you can take is to tie a small clear bobber to your line, followed by a 4' or 5' very light leader, and tie a fly on the end. You can cast this with regular spinning gear and probably get more distance than the fly fishermen in most instances. You then VERY SLOWLY retrieve it back so that it looks like a bug drifting along. If you are fishing in moving water you can just let it drift on its own and reel in slack. The fun part of this is that you can see the fish eat your fly most of the time. The hard part is that they usually bite and spit it out in one quick motion so you have to be very fast on the hookset. This tactic has been very productive for me in times when all else failed. 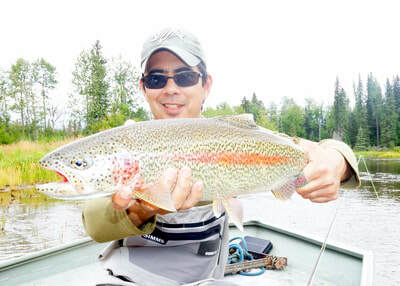 For bigger trout, a plug like a Rapala Countdown or Yo Zuri Pins Minnow is often the ticket. I stick to either silver colors or colors that resemble small Rainbow Trout. These are also very good for Brown Trout and catch the occasional Largemouth Bass as well. Probably the most popular bait for trout is PowerBait, which is a playdough-like substance that comes in a little plastic jar. There are a bazillion colors and everyone has their favorite. You just mold some on a small treble hook, put a small sliding weight between 12-30 inches behind it, cast it out, and let it float off the bottom. For whatever reason I've never been a big fan of this stuff but it works. There are a lot of other similar baits but I have never experimented with them as they just aren't my thing. If I'm going to fish bait for trout I usually go with the old classic, the worm. I like to fish either a whole red worm or half of a large nightcrawler on a small single baitholder hook. Instead of suspending it below a bobber, I usually attach a sliding sinker and have the worm 12-24" from it. One trick that works very well is to get a syringe and inject the worm with air so that it floats off the bottom. 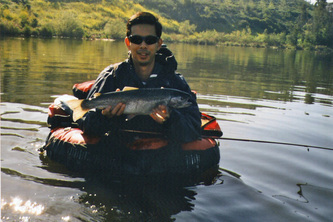 This makes it much easier for the trout to find and usually works a lot better than having the worm sit on the bottom. It's good to move the bait every once in a while. If I am fishing in a river, my go to bait is usually a single salmon egg suspended below a small bobber. I cast upstream and drift it through likely-looking spots. If the bobber dips or moves unnaturally I set the hook. If I am fishing in a lake with which I am unfamiliar, I usually start at an end of the lake that has a stream flowing in or other moving water. It seems those spots always cause fish to congregate. I usually set up one rod with a floating worm, cast that out, put a strike indicator of some sort, put it in a rod holder and then fish around that spot with a Kastmaster or other lure for a while. If I get no hits on either the worm or the lure in about 1/2 hour I go to another promising looking spot. That approach seems to work pretty well all the places I have fished. Of course, I'm always on the lookout for fish activity such as trout rising for insects or chasing baitfish on the surface, birds diving to pick off baitfish, etc. If the water is very clear and I can see the fish I switch to the plastic jig in a natural color. I put it in front of the fish I can see and see how they react to different types of twitches. If I see a trout become interested in a certain retrieve, I will try that in other spots, even if the trout I could see does not ultimately eat. Many times it is harder to catch the fish that you can see, especially in still water, because they can see you. When fishing in a river I like to concentrate on slower moving pools and spots of slower moving water behind large rocks. Trout don't sit in the fastest part of the current; that would tire them out. They wait in ambush in spots outside the current and dart out to eat things that float by. Try to make your bait or lure float by in the same way that a stray bug or worm or fish might. They have to make a split second decision on whether to eat it or not and are generally easier to catch than trout in lakes as a result. Alaska has some of the largest wild rainbow trout in the world. If I were looking for a trophy rainbow I would go there. I have also heard of a place called Jurassic Lake in Argentina which is supposed to be absolutely insane for rainbows in the 8-12lbs category. California and some other states have stocked fish that are genetically bred to get huge, but that just doesn't seem the same. These stocked fish do not fight as hard as the wild ones and generally do not have the brilliant colors that the wild ones do. Their fins are often torn as well, although if they survive in the wild for long enough they grow back. Ronnie Kovach's book Trout Fishing in California is an excellent resource. 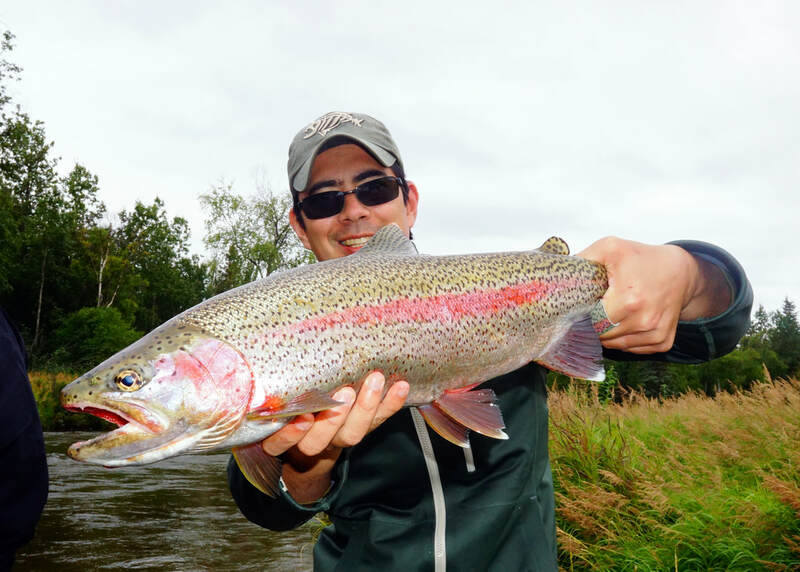 Have you caught a trophy Rainbow and now would like a high quality replica or mount? These guys will do a fantastic job for you: www.lakecountryreplicas.com. They do replicas of many popular fresh and saltwater fish. A perfect addition to your den, office, cabin, etc. 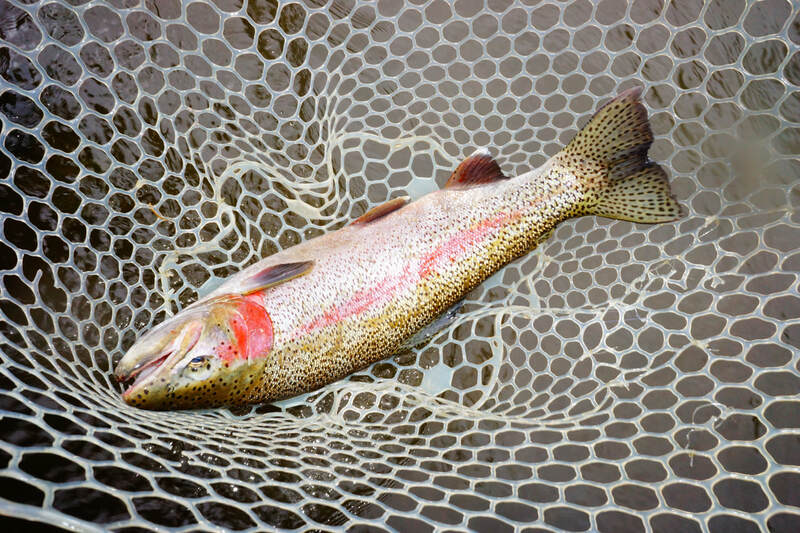 A nice Rainbow makes it into the net. Note the plastic net is much better for releasing the fish healthy.